When the temperature rises, the outdoors becomes a dreamy oasis. Although we can't wait to soak up the sun as daylight savings springs us forward to warmer weather, we may forget how warm that summer sun can get as it beats down on our shoulders, gardens and spanking new patio furniture. 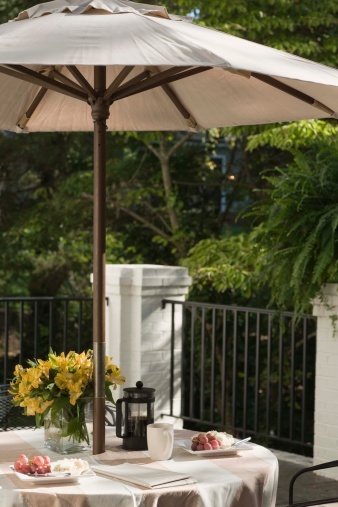 Shade cloth is a versatile outdoor workhorse. It can cool your vegetables, provide temporary shelter on camping trips, take your patio from sizzling to satisfying and offer a backyard oasis where there was none. Its webbed structure may be thick, but it isn't too hard to manipulate the material to sew sails, curtains, covers and other outdoor heat savers. The two types of shade cloth, woven and knitted, come in all colors and widths for most any project you can dream up. The domestic-grade shade cloths have 50 to 99 percent UVR protection while its commercial cousins offer much more superior protection, although they may be harder to work with as they come in large sheets for big areas. Shade cloth can reduce temperature by 36 percent. Black shades block light but still allow heat to rain down on tender plants and bare backs. White or other highly reflective shades reflect heat as well as light. Most sewing machines should be able to handle shade cloth. You'll want to go slow as the fabric can be rather heavy and bunch up in your machine as you feed it through. Check your owner's manual for suggestions on the needle shank you may need. Most home sewing machines use a System 130 needle, flat shank. A ball point needle will do a better job with knitted and stretchy fabrics, such as shade cloth. Once you've measured and plotted the space you plan to cover, gather poles, eyelets or other hardware and your shade cloth. Cut the shape you intend to use at least 6 inches extra in all directions to give you some space for basting and overlapping. Bind up your edges and carefully sew your shade cloth in the form you cut out. You can also use double wide fabric tape to fasten your hem before you sew. The heaviness of the shade cloth can make it difficult to feed through your machine. Make sure you use a nylon, polyester or other rugged thread that won't unravel in the weather. Consider other areas for the adaptable cloth that will bend to your will and whimsy in the great outdoors.